Gordon Shedden (pictured leading) will be hoping for a win or two in front of his home BTCC crowd at Knockhill this weekend when the Fife circuit celebrates 20 years of touring car action. There is now less than a week to go before the UK’s premier motor racing championship – the Dunlop MSA British Touring Car Championship – makes its annual trip to Scotland and one of the most spectacular circuits on its calendar, Knockhill in Fife which hosts the series’ latest three races this weekend (Sat 25/Sun 26 August). With its off-camber corners and blind brows, Knockhill is rated by many as one of the toughest driving challenges of the BTCC season. Furthermore its trackside crowd is among the most passionate of the year as tens of thousands of people turn out to cheer on their home heroes, namely, in 2012, Dalgety Bay’s Gordon Shedden and Inverness-based Dave Newsham. Shedden, vying to become the first Scotsman since John Cleland in 1995 to win the BTCC title, will arrive lying second in the standings to his Honda Yuasa Racing Team team-mate Matt Neal who pipped him to last year’s crown. Meanwhile Newsham, driving a Team ES Racing.com Vauxhall Vectra, will go into the event truly on a confidence high following his first race win in the BTCC just over a week ago at Snetterton in Norfolk. Making 2012’s event extra special is the fact that this year Knockhill is celebrating 20 years of BTCC action. Almost every living Scottish driver to have graced the BTCC grid at Knockhill during the past two decades will be present, including Cleland who will be reunited with his famous Vauxhall Cavalier for several demonstration laps. A number of iconic BTCC cars will also be present, including a Honda Accord once raced by the much missed David Leslie. 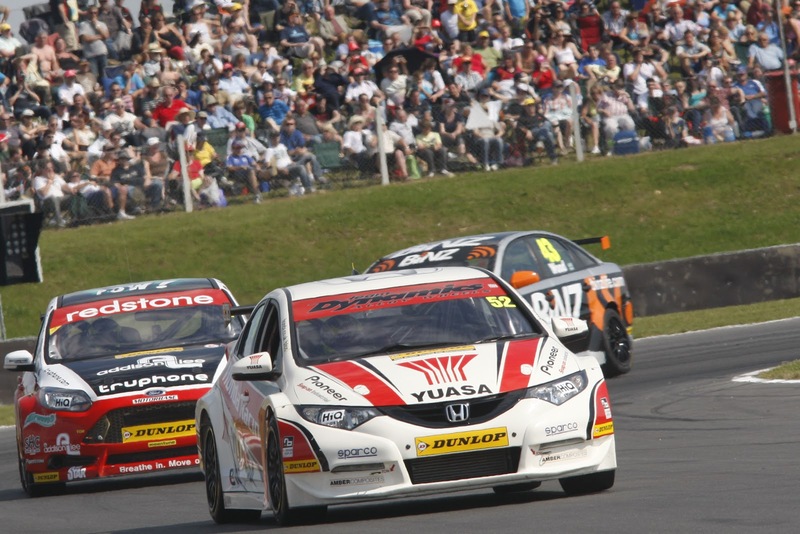 Shedden is now the most successful Scottish driver in the BTCC in terms of race wins and also boasts an unrivalled six victories to date in 2012. Three of his 27 career wins have come in front of his home fans at Knockhill and he commented: “It is just going to be a phenomenal weekend for Scottish sport. The BTCC is always spectacular, particularly so at Knockhill because of the nature of the circuit and the fact it falls at such a crucial time in the calendar. After this weekend we start to get a picture of who are the men most likely to be in with a shout as we get to the business end of the season. In all seven drivers – Neal, Shedden, Plato, Newsham, Andrew Jordan (Pirtek Racing Honda), Robert Collard (eBay Motors BMW) and Mat Jackson (Redstone Racing Ford Focus) – have won races so far this season. Others, including Frank Wrathall (Dynojet Toyota Avensis) who took a career-first pole position in qualifying at Snetterton last weekend, have shown they are more than capable of mixing it with the title protagonists as well. Keeping the BTCC crowds at Knockhill this weekend (25/26 Aug) further entertained will be an additional 11 races for the supporting Porsche Carrera Cup GB, Ginetta Junior and Ginetta GT Supercup categories as well as the ‘guesting’ Celtic Speed Mini Cooper Cup and Scottish Classic Sports & Saloons series. Rory Butcher (Kirkcaldy) and Glyn Geddie (Aberdeen) are among the front-runners in the Carrera Cup – indeed Butcher still has a realistic chance of winning the crown. Charlie Robertson (Aberfoyle), aged 15, is also a title contender in Ginetta Juniors while Fergus Walkinshaw (Edinburgh), son of the late, great Scottish touring race winner and team boss Tom Walkinshaw, is one to watch in the GT Supercup. Admission to the event is FREE all weekend for accompanied children aged 12 and under. Tickets for adults will remain on sale at special advance rates until Saturday (25 Aug) via the www.knockhill.com website or by calling 01383 723337. Apologies for the interruption to posts. This is due to technical difficulties to do with our RSS feeds. BTCC Back in action this weekend.